Echeveria glauca is one of the best blue types around and very aptly named - 'glauca' means blue in Latin, the language of plant names. Well behaved, arrowhead shaped leaves form flat rosettes and offset rapidly to form clusters, leading to its other name of hens and chicks, although the related but much hardier Sempervivum is also known by this name, which makes for some confusion. The size of each individual adult rosette can be up to 20cm (8") but can form clusters of many offsets, making a colony of hundreds of plants. 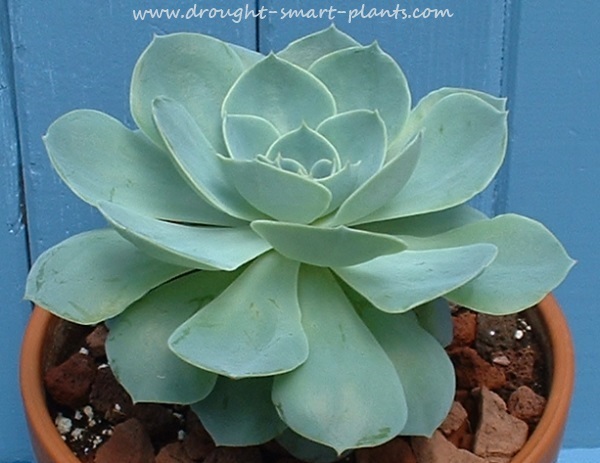 The conditions in which Echeveria glauca will thrive are frost free, brightly lit and with good drainage. 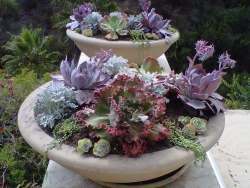 Propagate by leaf cuttings, or removing offsets. Allow the leaf cuttings to callous overnight or just leave them on the surface of the soil to form roots. Use in mixed plantings, as specimens planted singly or as groundcovers in xeriscaping in warm climates that never get frost.